Jenna Marceau and Syndeo are receiving national attention. Bizwomen selected Marceau, Syndeo’s director of implementation and systems management, as a 2018 “Headliner” in the professional services sector. Bizwoman is a digital news platform featuring stories and information about women in business across the U.S. and is an arm of Charlotte-based American City Business Journals. Headliners were selected from those who won awards in 2018 across 43 business journal cities. 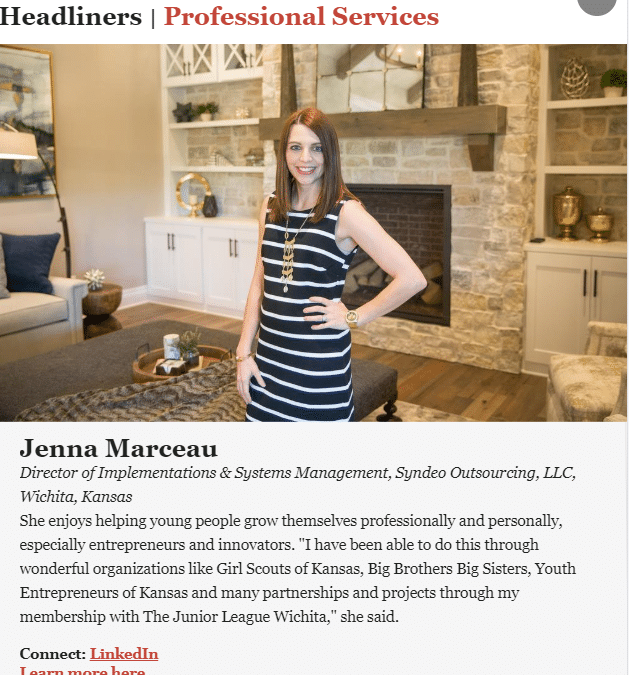 Marceau was a Wichita Business Journal 40 Under 40 honoree last year. She also is participating in the WBJ’s Emerging Leaders program. Marceau is one of 75 professional services headliners Bizwomen chose. As the Heartland’s leading employer services company, Syndeo partners with local business owners to help them minimize risk, improve efficiency and maximize profitability allowing them the freedom to focus on growth and fulfilling their mission.